HOSA — formerly known as Health Occupations Students of America — blood drive volunteers Calli Jones, Tyreece Peterson, Madison Arthur, Kylie Stephens, and Alyssia Echols. Submitted photos Senior Liam Rose donating blood during a drive held at Xenia High School. Senior Liam Rose donates some blood. XENIA — Xenia High School student Liam Rose is a big and boisterous member of the marching band who admits to breaking into song after donating at the school blood drives. Now a senior, the fourth lifetime donation he made April 12 at Xenia’s spring blood drive will be his last as a Buccaneer. “People say you get ‘senioritis’ but I have one more class to pass so I just stay focused and not worry about it,” he said about his final weeks of high school. He’ll leave as a Red Cord Honor graduate for registering to donate three or more times with Community Blood Center during his high school years. “I’m going to keep it.” he said. Fellow senior Samantha Price also made her fourth lifetime donation at the drive. She studied in the health science program and became interested in donating while learning about anatomy and the body’s systems. Students learning about health careers are dedicated supporters of Xenia’s annual December and April blood drives. HOSA (formerly known as Health Occupations Students of America) is the student-sponsor group for the blood drives. HOSA is an international organization of future health professionals under advisor and biotechnology instructor Molly Wavra. “They’re interested in health careers and this is an asset where they can see some of those careers in action,” Wavra said as she helped her volunteers assist donors and serve pizza in the Donor Café. The blood drive totaled 78 donors, including 23 first-time donors and 59 donations. Xenia’s total for the year was 171 donors, 77 first-time donors and 139 units donated. HOSA volunteer Calli Jones is a junior who attended the HOSA leadership conference in Columbus. Her goal is to get into medical school and become an orthopedic surgeon. “I think it’s really interesting, I think it’s really cool and I can’t wait to be part of it someday.” she said. The HOSA club focuses on state and national competitions, social activities and community service, which includes the blood drive. The volunteers were busy stacking pizza boxes and cleaning up café tables as junior Rylan Hill made the final donation of the blood drive. She made her first lifetime donation at the December blood drive and was happy to donate again. “It’s knowing that I can help someone,” she said. 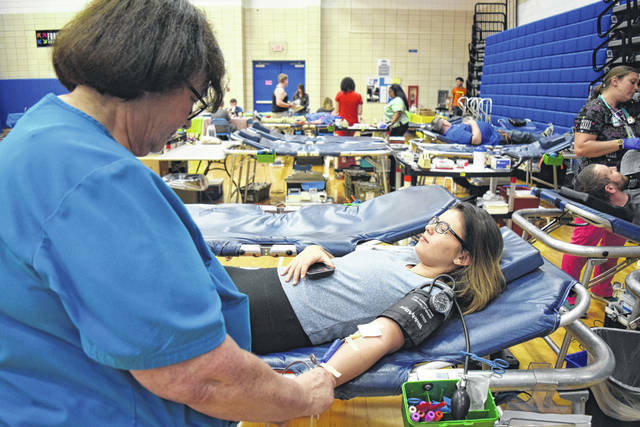 Several seniors at the Xenia High blood drive say they plan to enter the CBC/Vectren Lead The Way Scholarship competition before the April 20 deadline. CBC/Vectren will choose the top five blood drive recruitment campaigns submitted to receive $1,000 scholarships. More information and an online entry form is available at www.GivingBlood.org. 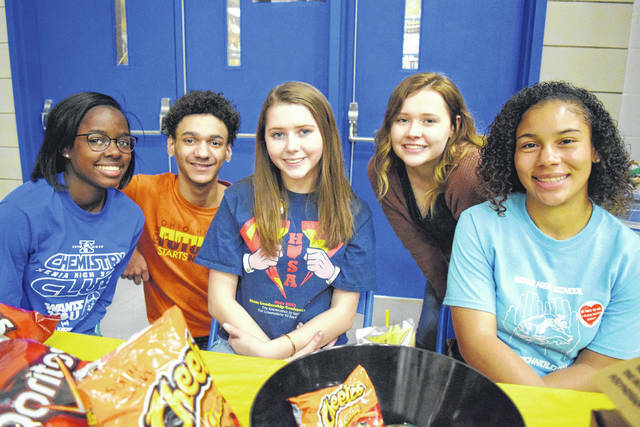 https://www.xeniagazette.com/wp-content/uploads/sites/32/2019/04/web1_HOSA-volunteers.jpgHOSA — formerly known as Health Occupations Students of America — blood drive volunteers Calli Jones, Tyreece Peterson, Madison Arthur, Kylie Stephens, and Alyssia Echols. 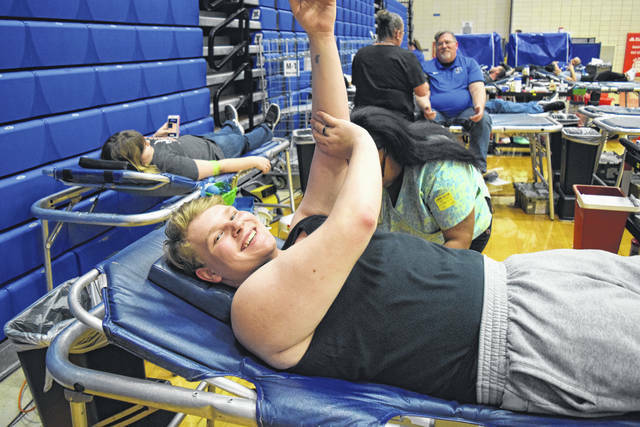 https://www.xeniagazette.com/wp-content/uploads/sites/32/2019/04/web1_Liam-Rose.jpgSubmitted photos Senior Liam Rose donating blood during a drive held at Xenia High School. https://www.xeniagazette.com/wp-content/uploads/sites/32/2019/04/web1_Rylan-Hill-donating.jpgSenior Liam Rose donates some blood.